How can I flash the BIOS on a Dell T5500? I been given a Dell T5500 Workstation that used to be maintained by a gentleman that no longer works at the company I work for. The workstation has a BIOS admin password as well as a BIOS boot password that are not the same. I know the boot password because I used the machine prior to him leaving but failed to get the admin password from him. I need to install a new OS on the workstation, but I'm not given the option to boot from CD before or after the BIOS boot password prompt. I assume this is because the option was either disabled in the BIOS or because it's not presented when theres a BIOS boot or admin password present. I figure my only way around this is to flash a new BIOS on the workstation which is probably a good idea since I currently have no way to make changes to the existing BIOS. What's the process for flashing the BIOS on a workstation such as this? Is a floppy drive needed (this machine doesn't have one)? Is it even possible if I don't have access to the current BIOS settings? The Dell Precision T5500 has jumpers specifically for clearing passwords. Locate the 4-pin password connector (PSWD) on the system board. Remove the 2-pin jumper plug from pins 3 and 4 and set the jumper plug aside. Connect your keyboard and mouse, then connect your computer and monitor to electrical outlets and turn them on. After the operating system loads, turn the computer off. Disconnect the keyboard and mouse, then disconnect the computer and monitor from their electrical outlets. Press the power button on the computer to ground the system board. 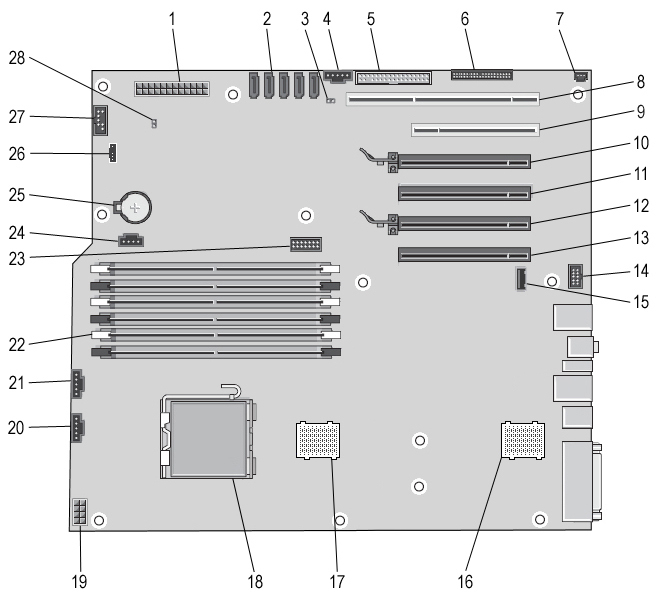 Replace the 2-pin jumper plug onto pins 3 and 4 of the password connector (RTCRST_PSWD) on the system board. Connect your computer and devices to electrical outlets, and then turn them on. Once you've done that you'll have to flash the New BIOS using an external floppy drive. We have a couple USB2 floppy drives we use of cases like this. Not the answer you're looking for? Browse other questions tagged dell bios or ask your own question. How to reset Windows XP password on Dell server with RAID? What is a BEV device? Can the Dell PowerEdge T320 boot from a USB stick in hard drive emulation mode? How to update a Dell server when the Dell Server Update Utility ISO is 11GB?